LANGUAGE FLOWS through the work of artist Frances Stark in singular, unusual ways. In several works on paper in her current Hammer Museum retrospective she portrays herself as a bird—a peacock, a wren, a cockatoo­—as in Portrait of the Artist as a Full-On Bird (2004), grasping a twig made of collaged letters; or a woodpecker, as in A Bomb (2002), about to nudge with its beak the penciled “A” in an Emily Dickinson fragment printed and repeated in the shape of a sphere. The bird analogy is fitting in many ways for an artist who flits between media, alights gently, sometimes tentatively, on ideas, and pecks through a library’s worth of books for bits of text. But the bird is also in her name: Frances Stark, starling, lark, perching on branches—and “stark” describes the spare, black-and-white aesthetic of many of her works; stark is the way she bares her person, and/or her persona. “But what of Frances Stark,” the title of a 2009 artist’s book asks, “standing by itself, a naked name, bare as a ghost to whom one would like to lend a sheet?” The perfect fit of this artist’s name is almost enough to convince you that people are language’s instruments, and not the reverse. The expansive nature of Andrea Zittel’s work is hinted at in her name, from whose initials at opposite ends of the alphabet she takes the title of her one-woman operation, her A–Z enterprise, her “institute in investigative living.” Her home-studio compound is situated in an area of California’s Mojave Desert where hippies, artists, and libertarians roost in scattered off-the-grid outposts on the outskirts of Twentynine Palms, the massive U.S. military base containing Combat Town, a replica of a Middle Eastern city. Given that it accommodates contradictory approaches to organizing one’s life—fugitives from society’s restrictions at one extreme, soldiers following intricate rules at the other—the Mojave suits Zittel’s unconventional social laboratory. In keeping with her A–Z mentality, Zittel started her career on the opposite coast, in New York, customizing spaces and objects in a Brooklyn row house in the early 1990s before returning to her childhood home of California in 1999. A–Z West, so called to differentiate it from its forerunner, began as a 200-square-foot homestead on a parcel of rocky land and has since expanded like a steadily growing tentacular organism to include numerous other structures, projects, and bits of property. 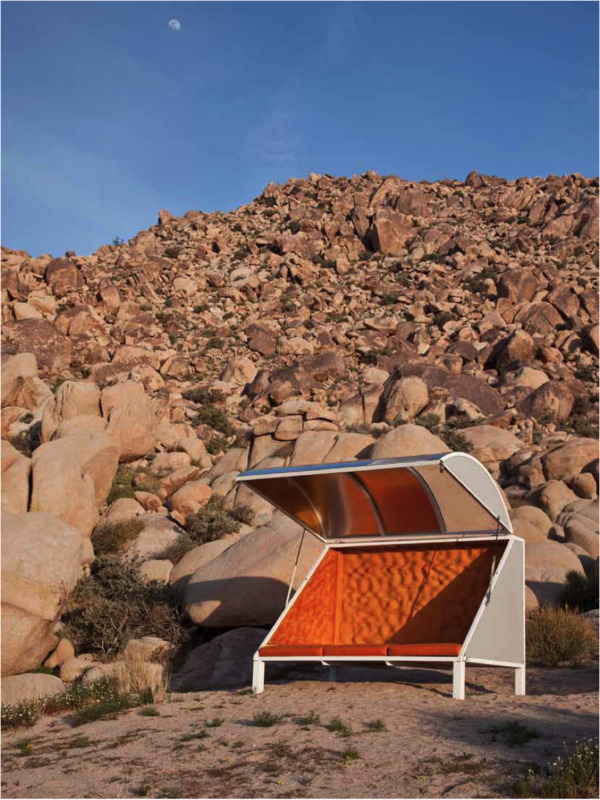 Scattered among the compound’s acres of boulders and shrubs are examples of Zittel’s Wagon Stations, transportable one-person living compartments that open and close like metal-and-glass clamshells. The idea of a shelter reduced to a human shell: Frederick Kiesler, the iconoclastic namesake of Austria’s Kiesler Prize for Architecture and the Arts, which Zittel received in 2012, might approve. “The house is the skin of the human body,”1 Kiesler declared in one of his manifestos advocating for more fluid intersections between humans and their natural and technological environments, a spirit shared by his peer R. Buckminster Fuller, another of Zittel’s precursors in freeform, Utopia-minded, category-defying thinking. As with Kiesler, Fuller, and other multi-hyphenate visionaries, even the catch-all terms “artist” and “designer” don’t quite seem to encapsulate Zittel. Her projects to date include experimental breeding units for quail, an ongoing series of handmade uniforms designed for her personal wear, a week spent without clocks in a windowless room in an effort to slip regimented time, a fabricated, habitable island off the coast of Denmark, functional furniture, tools, and living environments, and, most recently, textiles woven by expert artisans and large-scale paintings. With Zittel, a design isn’t merely, or isn’t quite, a design; with few exceptions, her prototypes—for travel trailers, chamber pots, eating utensils, living units—aren’t intended for production on any kind of mass scale. They are hypothetical prototypes, prototypes of prototypes. And a painting—or wall work—by Zittel tends to be not merely, or quite, a painting: her main series of paintings is produced under the collective title Prototypes for Billboards, lending them, as with a good deal of Zittel’s work, a ghost element, a conceptual parallel in which you imagine them functioning out in the world, the painting on the gallery wall giving way to a version of giant proportions along a highway meant to be viewed by drivers at far, middle, and close range. A second series of paintings consists of smaller gouaches in Zittel’s crisp style that borrows advertising’s easily digestible visual language, illustrating prototypes for hypothetical garments and structures, or showing realized versions of prototypes in use. The protean, boundary-testing quality of Zittel’s work isn’t merely formal; it’s central to her implied philosophy of living. “We are most happy when we are moving towards something that is not yet attained,” proclaims one of the “Billboards” paintings (Prototype for Billboard at A–Z West: “These Things I Know for Sure” #14, 2005), part of a sub-series that grew out of her curiosity over whether she had any solid, unchanging beliefs, even minor ones, in an era when belief is taken as a matter of perspective. 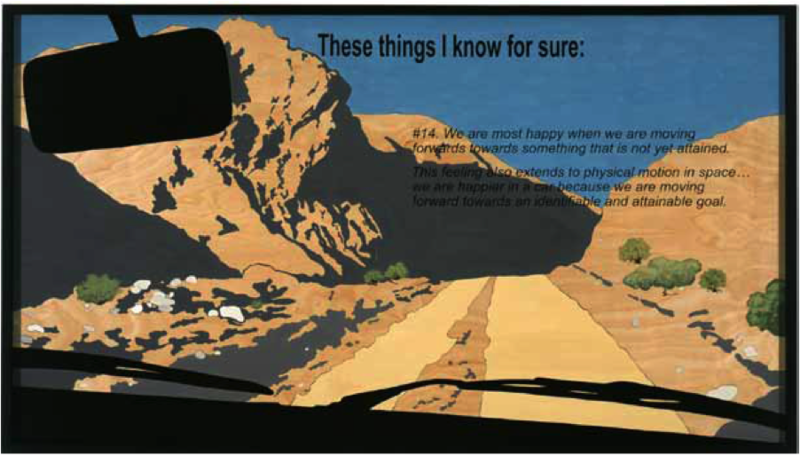 The text continues, printed over an image of a desert road as viewed through a windshield: “This feeling also extends to physical motion in space… we are happier in a car because we are moving forward towards an identifiable and attainable goal.” The connection between happiness and mobility is a consistent theme with Zittel, and not coincidentally seems to extend to her method of working: a sense of movement, of forward momentum, pervades her work, which is full of ongoing series, the Prototypes for Billboards and well-known A–Z Personal Uniforms among them, while she sets a self-imposed two-year limit on any projects undertaken at A–Z West to avoid stagnation.2 She sees failure as a method of propulsion: “Every single piece is flawed in some way,” she has said, “and it’s that flaw that I work off of for the next piece… Only once did I make a piece that I felt pretty satisfied with, which was the A-Z Escape Vehicles, and everything stopped dead for about a year after that. I hope I never make a successful piece that I like again.”3 As in the analogy of the driver, satisfaction seems greatest in a transitional state, when the next thing is visible on the horizon. Maximized possibility, prime mobility, hovering in a conditional tense where options are open, yet somehow measured (after all, the car is traveling on a road)—this character manifests as well in Zittel’s recurring motifs and techniques. Weaving has long been a central element in her work, endlessly varied patterns created through simple, repeated manipulations of only a few strands. 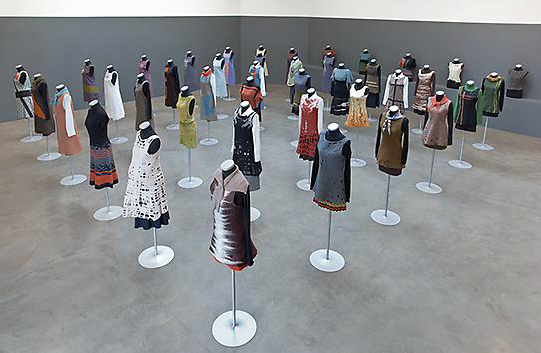 Since 1991, when she conceived her first set of uniforms as a means of evading the rule of daily outfit changes, she has produced over seventy versions, from fantastical felted dresses to basic Constructivist-style aprons; the cumulative effect is that fiber strands have been passing through her fingers for over 20 years. Crochet patterns resembling open-ended mazes show up in her paintings, while her recent Wall Sprawl works, a series in which aerial photographs of exurban development are tiled and flipped to form wallpaper-like designs, roadways resembling tangled thread—are in theory infinitely expandable. One thinks of webs, and a spider is a good metaphor for the type of artist Zittel is—spinning out an art practice through a steady stream of consistent acts, creating a physical site, a habitat of her own making for others to buzz around: art-making as a kind of high-order biological process, a system that gallery exhibitions tap into, rather than vice versa. 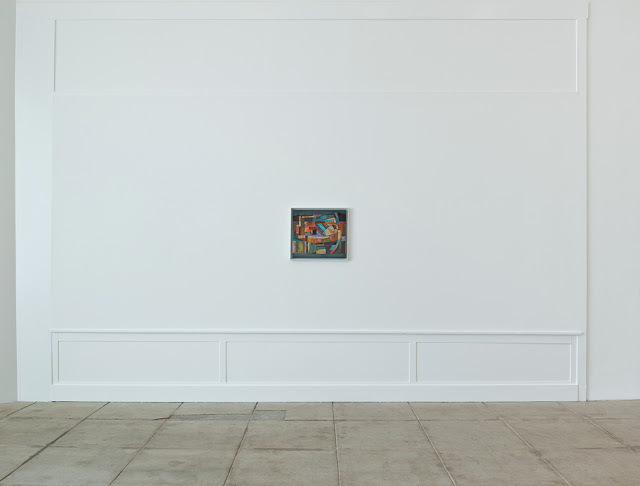 Zittel’s most recent New York solo exhibition, at Andrea Rosen Gallery last fall, synthesized the major themes or tributaries that have flowed through her art since its earliest days. 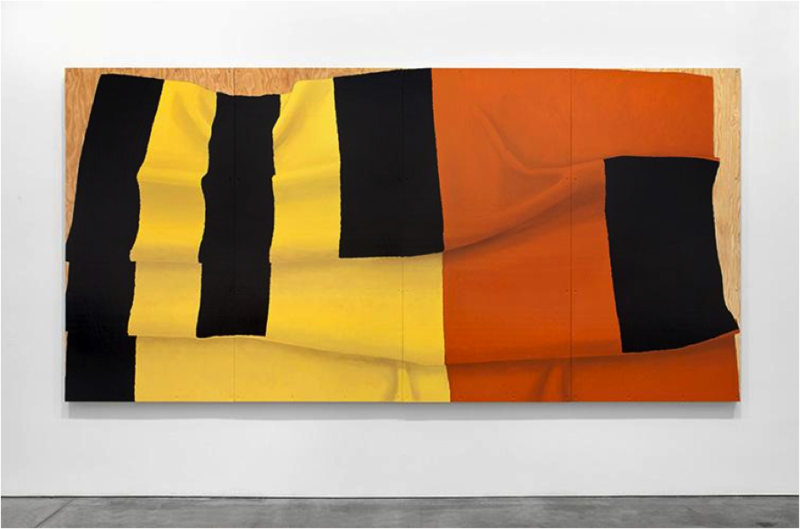 The sure sense of direction that has always been a feature of her work felt more pronounced—the A–Z Covers series that first appeared in 1993 melding with the Prototypes for Billboards series, for instance, to form a pair of large, striking paintings in which color-blocked textiles in hot desert tones appear to slide off the vertical plane. Meanwhile, the weaving component of her practice moved onto the wall in the form of A–Z Cover Series 1 and 2 (2012)—woven canvases, in effect, with colors embedded in the thread, a kind of reverse painting, created by teams of master weavers following Zittel’s instructions, but with room built in for subjective decisions. 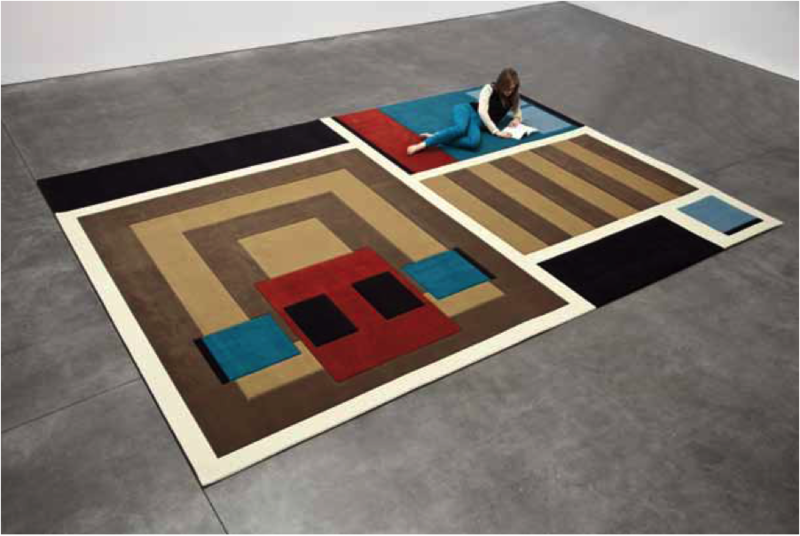 “My goal is to make a work that is simultaneously a highly rendered artisan object, conceptual art, and functional object,” she wrote in a statement accompanying the show, noting that Mies van der Rohe hung Rothko paintings alongside Navajo blankets, being obsessed with both. In one of his odd, prescient, and illuminating short essays on the nature of design, the midcentury media philosopher Vilém Flusser, in a moment of optimism, envisions a future culture “with less and less room for objects of use to act as obstacles and more and more room for them to serve as vehicles for interpersonal contact. A culture with a bit more freedom.”4 It’s a vision Zittel could be said to share. From carpets eliminating the need for furniture to trailers that consolidate living spaces to tables with depressions for food that do away with the need for plates, the alternate reality she has imagined into existence is one comprised of surroundings that facilitate the flow of life, sometimes melting the built environment into the background, sometimes melting it closer to the body. If, somewhat uniquely among contemporary artists, from the beginning of her career Zittel has persistently and explicitly addressed a central question, that of how to live, her implied answer might be in a world that allows not just for greater mobility, but more conscious mobility—literal mobility, as offered by her wheeled A–Z Travel Trailers, A–Z Mobile Compartment Units, and A–Z Yard Yachts, but more often a sort of psychic mobility. Human habitat echoes our essential psychological makeup: walls for security, doors for freedom, and windows for striking some sort of compromise between the two—seeing outside without actually leaving. Without walls, people die of exposure or attacks; without doors, they starve in more ways than one; without windows, they can live, but not happily or even sanely. The cliché equating art with a window is a truism: it’s windows that represent possibility—the promise of mobility without its dangers. Zittel’s work does not only operate in this zone of hypothetical escape, the happy gap between feeling trapped within one system and realizing we’re trapped in the next; it examines the quality of this experience and our desire for it, scrutinizing the meaning of progress and unpacking the paradox that in order to move forward, we have to close off possibilities. The act of shuttling between poles of freedom and limitation lies at the center of her work, and perhaps one reason her project feels relevant is that it keeps driving at the heart of what art’s role has been ever since the demise of religious faith removed many people’s sure sense of existential boundaries. “Everyone is born a genius,” Fuller famously said. “But the process of living de-geniuses them.” Modernity makes it easy to travel mindlessly on tracks. What Zittel suggests, in her way of observing the strands as they are knit, being ready to manipulate (or not) the possibilities of the next stitch, is that the process of living can be transformed into occasions for ingenuity. THE 10 MODESTLY SIZED PAINTINGS IN SCOTT OLSON’S SECOND solo exhibition in Los Angeles are widely spaced on the gallery walls—expansive white space pooling around works that are meditations on attention, balance, surface and framing. Each is further enclosed by borders left blank and/or by a tidy handmade frame of poplar, maple, or onyx- or mahogany-stained cherry, as if Olson means to center and carefully set his paintings (all untitled, 2012) in our field of vision. A basic aim of almost all painting is to gather shapes and colors into a bounded physical space as a means to collect, focus and manipulate attention. Olson’s paintings do this pointedly, while also acting as open records of the attention that goes into their creation—the interplay on the artist’s end between activity and passivity, improvisation and deliberation. 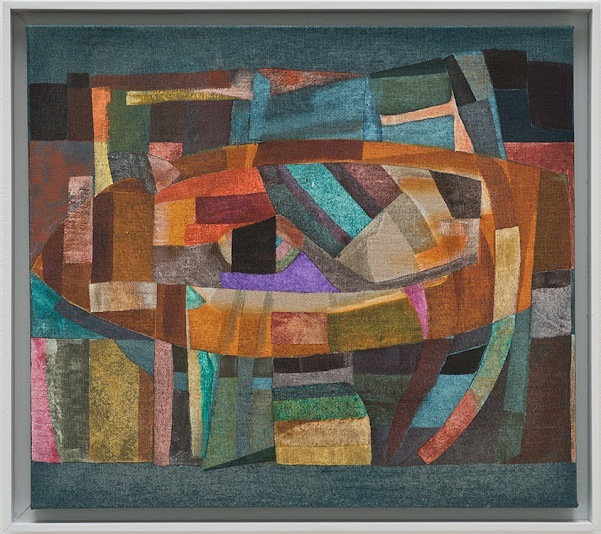 Irregular shapes in a broad, even random palette of colors ranging from muted browns to aqueous blues to bright yellows and oranges sift across the paintings’ surfaces in overlapping planes, creating an illusion of depth. There’s an ephemeral character to the arrangement of Olson’s forms, like leaves organized into patterns on a lake’s surface, as if each painting is a snapshot of a composition on the verge of dissipating. It’s a mesmerizing effect that seems to come from calibrating conscious and unconscious input, with an equal give-and-take between what nature allows to arise and what the educated, purposeful artist places. Olson’s process pulls in elements from the natural world as well as from painting’s history. His magenta derives from ground beetle extract, his orange from cosmos flowers’ pollen. Various works incorporate wax, oil, egg tempera, and silverpoint, on supports that include linen and panels coated with ground marble dust—a suede-like, luxurious surface for a painting. Experimental homemade tools help create marks, further balancing intention and accident. Shapes may appear stenciled or printed; scraped lines reveal sub-layers. A kind of game ensues as we reverse-engineer the mechanisms that created the painting, our imagined versions of the artist’s tools inevitably failing to align with reality. The paintings sit poised between an experience of process: painting as verb, and of product: painting as noun, and of painting as image and physical object. There may be something of a trend toward diffusion in current art, a reluctance to clearly define a plane or to direct experience, as if to give the impression that the art has wandered into frame, or that a frame has haphazardly sketched itself around the art; one finds evidence of this quality, for instance, in the Hammer Museum’s present LA biennial exhibition. Though this can be an interesting concept, it’s frustrating when taken too far, when the viewer feels charged with the bulk of the responsibility of organizing an artwork. Olson, showing intense interest for what finally emerges on the surface of an artwork’s plane, with what ends up in its bounds, has made paintings that exemplify how deliberate, definite artworks can preserve a sense of possibility and openness. The latest dispatch from Andrea Zittel’s A–Z West fills both galleries at Regen Projects with a phalanx of her famous handmade personal uniforms, two wallpaper designs from a recent series titled “Wallsprawl,” four paintings from a series of billboard prototypes, and a large model, “Lay of My Land,” of her Joshua Tree home-and-studio compound. The sculpture, an unpainted plaster landscape arranged over steel base sections, depicts the land parcels that make up A–Z West’s 35 acres—the “seemingly endless desert,” as Zittel puts it in an artist’s statement written for the show, carved into segments following the grid system conceived by Thomas Jefferson for efficient management of American Territory. “Lay of My Land” is born of her unease about the desert’s invasion by exurban sprawl, a sentiment stemming in part from childhood years spent in the region she returned to in 1999 after living in New York. But it follows as well in a long tradition of angst among American intellectuals and artists about the industrializing of the country’s wilderness lands. The “machine in the garden,” critic Leo Marx termed this theme in the 1960s, identifying its centrality to a host of American writers, from Thoreau—who, with his Walden outpost and ideas about nature, consumerism, and self-sufficiency, might be Zittel’s most obvious precursor—to Hawthorne, Twain, Frost, and, not least, to Jefferson himself, who fretted about the fate of his beloved pastoral Virginia. 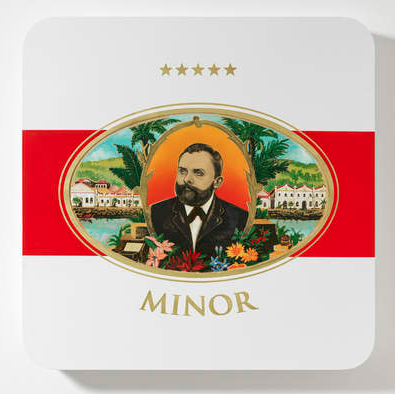 That Zittel’s work revolves around an explicit philosophy of life and art that, while not rigid, exerts a stable, coherent, central force on everything she makes, differentiates her from many of her contemporaries. 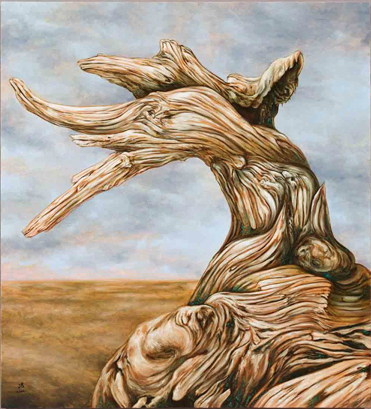 A series of paintings from 2006, “These Things I Know for Sure,” articulates some of its principles: “What makes us feel liberated is not total freedom, but rather living in a set of limitations that we have created and prescribed for ourselves” (#10); and “What you own, owns you” (#15). The self-possessed, sensible tone of these statements characterizes her art in general; even her ongoing, 20-year-long uniform project, in which she crafts one custom outfit per season, wearing it day in and day out, is as much an exercise in surefootedness as in limiting options and reducing reliance on store-bought clothes. Though conceived, often, as solutions for problems, as social critiques, her creations don’t shout their messages, but seem to exist as patient examples. Circling “Lay of My Land” (all work 2011), for instance, you are struck not by the concept of segregated land parcels, but simply by its detailed, quite beautiful surface, covered with individually sculpted rocks. Its whiteness and the rawness of its metal supports give it more than anything a ghostly, floating presence. The wallpaper pieces, meanwhile, made from aerial photographs of a shopping center (“Wallsprawl #6”) and an airfield (“Wallsprawl #4”), tiled and rotated to look from afar like spidery filigree, are born from Zittel’s concerns about human encroachment into nature, a process she likens to a “parasitic or viral expansion.” Perhaps she means for them to feel more sinister than they do, but one experiences them primarily as fascinating patterns. While “Lay of My Land” and the wallpaper works are visually seductive, the show’s two other components—the four “Prototypes For Billboards A–Z West” paintings and the gallery of uniforms (including examples from the ongoing “A–Z Fiber Form Uniforms,” “A–Z Personal Smocks,” and “A–Z Single Strand Uniforms” series begun in 1994)—are its highlights. Displayed on a neat regiment of mannequins, the selection of 40-odd outfits—hand-felted tops, crocheted sweaters, dresses made from single fabric pieces—dazzle in their variety of form, texture, and technique. Knitting and crocheting, in which a limited number of strands, through a limited set of repeated gestures, can be made into infinitely varied garments, are, for Zittel, meaningful actions; even beyond her uniforms, stitch patterns show up in her work as frequent motifs. Their echo appears in the four billboard prototypes—collectively subtitled, for the show, “Bodies in Space with Objects”—that borrow imagery from Constructivist propaganda and depict maze-like designs superimposed over desert landscapes. 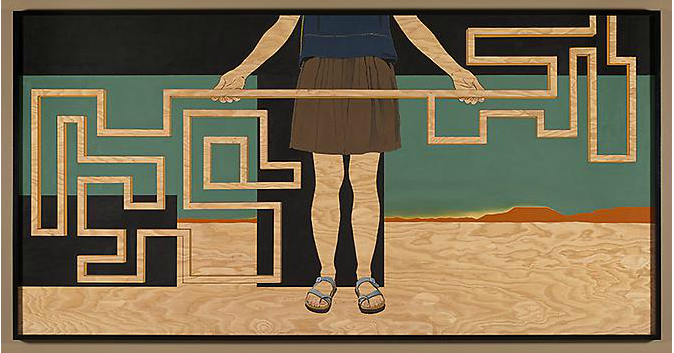 The paintings are portraits of sorts: in three of them, a female figure, her face cropped out of frame, her skin and the desert floor both represented by areas of unpainted plywood, holds the maze form in her hands—the artist and her plans, or else a person introducing into the organic desert a structure born of her mind, a thing shaped by geometry, by equations, which is the distinguishing feature of human habitat. The paintings link the artist with the human march that she protests against. Touched with melancholy as well as hope, they designate ideas yet to be realized. 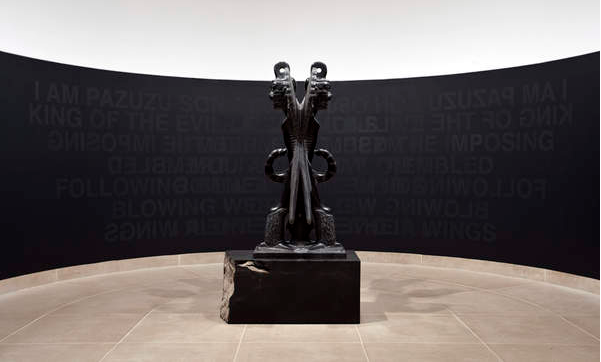 Roberto Cuoghi’s first solo show at a U.S. museum, in the Hammer’s vault gallery, consists of “Pazuzu,” a black marble sculpture inspired by a demon-god from pre-Christian Assyria, circled on three sides by twenty-odd mixed-media portraits (all untitled, all works 2010) of Cuoghi’s imagined alternative selves. Among others, the cast includes a handful of glaring goateed thugs, various iterations of the portly bearded man featured in the logo for Dannemann brand cigars, a jaded-looking intellectual whose speech bubble floats the title of a Joseph Beuys installation, “Zeige Deine Wunde,” an obese cartoon Hulk, a masterfully drawn chiaroscuro face resembling John the Baptist as envisioned by Caravaggio, and a ghoulish, mouthless visage hovering above sets of teeth painted in lifelike enamel. All share a family resemblance: similar noses, similar foreheads, similar dark eyes and brows. While some are purely drawings—Cuoghi inked one figure on a brown bag and tacked it directly to the wall—the materials list for others reads like a mad scientist’s shopping list: hydrochloric acid, shell dust, compressed air, shellac, sheepskin parchment, Flexoid, soap. Cuoghi’s methods of construction in these layered works are mysterious, and their effects are wonderful. A portrait overlaid with iridescent powder (the shell dust?) 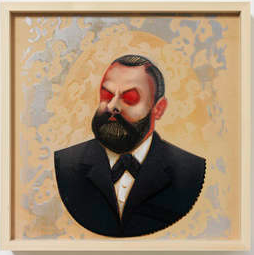 reveals a holographic skull when viewed at an oblique angle, while two oval portraits of the Dannemann cigar man are seamlessly inserted into metal surrounds, giving the impression of giant cigar box lids jutting from the wall. 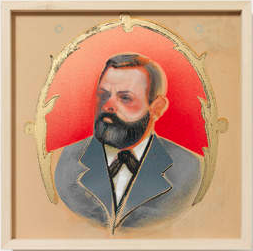 Given his interest in the outer bounds of identity, it makes sense that Cuoghi lavishes attention on framing, sinking some portraits into shadowy box frames, surrounding others in silken white hoops reminiscent of Matthew Barney’s beloved self-lubricating plastic, setting others in plain wood, and bestowing antiquey gold frames on still others, such as a small picture of a vulnerable-looking man turning his head, on which Cuoghi has painted each separate hair. The glass protecting the latter is dusted with fine particles, as if the artist discovered the portrait in a forgotten attic. 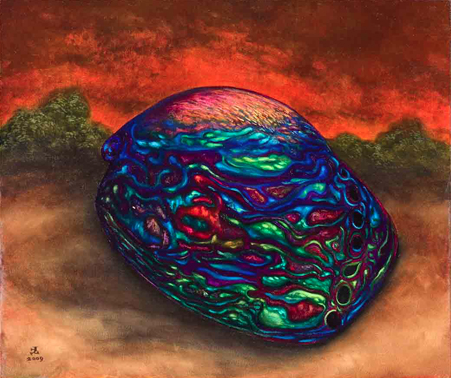 Distending, or transcending, whatever sphere contains the self, as well as perhaps the larger one that defines mortal humanity, is clearly one of Cuoghi’s obsessions. You can hardly write about him without mentioning his first foray into unorthodox self-portraiture, the project in which, beginning in 1997, in his mid-twenties, he morphed himself into a man resembling his sixty-something father, gaining nearly 100 pounds, dying his beard and hair grey, wearing an older man’s clothes, adopting an older man’s mannerisms, and living as this aged version of himself for seven years, only reclaiming his more natural appearance, with some struggle, in 2005. In a slightly later project, he wore a pair of eyeglasses fitted with prisms, so that his view of the world was flipped upside down; the disorienting and sick-making five-day exercise produced a suite of poems, grotesque self-portraits, and a video (“Il Coccodeista,” 1997). Jumping through time from youth to old age, inhabiting another’s body, inverting reality, knowing the selves you could be in a different life—if Cuoghi’s ambitions felt less grand, one could read his enactments of these god-like feats as parodying the ancient conception of artist as a kind of shaman, one whose gifts inched him closer to another circle of reality. But his work, with its streak of megalomania, seems, if not literally to embrace the idea, at least to fantasize about it. His sculpture of Pazuzu, a demon cobbled from a dog’s torso, scorpion’s tail, snake-like phallus, and double bird’s wings, among other animal odds and ends, not only aligns with his omnivorous approach to materials, but pointedly represents a time when a statue of a demon-god wasn’t just an object, but a dwelling place for the deity, possessed of supernatural power. Cuoghi has painted himself as uneasy with today’s version of art and artists. “I’ve never been totally involved in contemporary art and I was irritated by the boring habits of young artists,” he told Art in America in an interview published on the eve of the Hammer show. 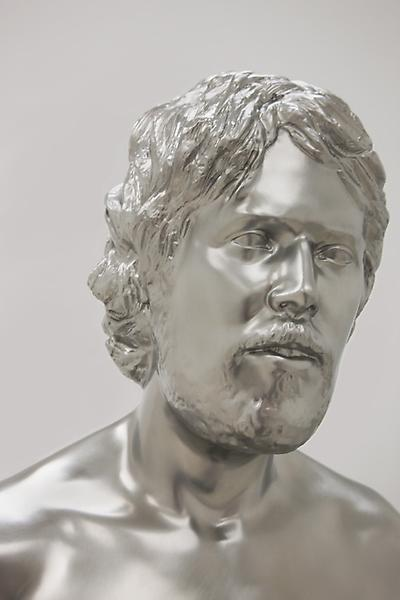 Transforming himself into his father, though he was in art school at the time, was never intended as an artwork, he says, but only as an escape hatch from his all-too-successful line of work as a forger of medical prescriptions. It makes for a stark contrast, then, that the Cuoghi show is installed directly across from the Hammer’s invitational exhibition “All of This and Nothing,” with its ethereal chords of spare beauty, ephemerality, and clean academic thought. Moving from the deep charcoal grey walls and sheer gathered power of his gallery, capped off by an actual demon statue, to the cloud-like floor sculpture of white plaster powder that occupies the large, white, facing room feels a bit like transitioning from Inferno to Purgatory and Paradise, which, while beautiful in their way, can’t help lacking the Inferno’s fiendish intricacy and force. 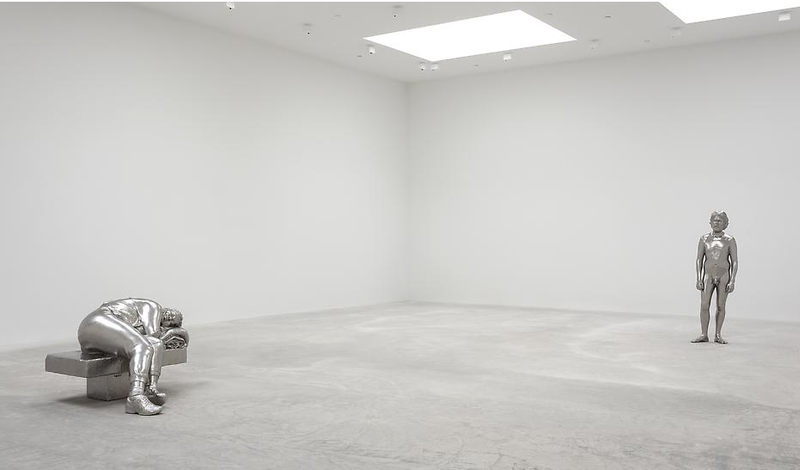 At half the size of the towering 2008 steel-and-fiberglass statue of Pazuzu that Cuoghi has shown at Turin’s Castello di Rivoli, London’s ICA, and The New Museum, the black Carrera marble version included in the Hammer show is made of Italian material. Where the larger work is a mathematical enlargement of a roughly 3,000-year-old Assyro-Babylonian talisman housed at the Louvre, the form of the smaller has been altered from the original. The new demon is doubled, with twin bodies fused at the spine, forming the shape of an X: an unpredictable being who faces both past and future, life and death, other and self, toward the world and away from it. Though it’s not explicitly claimed as one, we might see this modified Pazuzu as another self-portrait, or at least as a symbol of Cuoghi’s idea of an artist. In “Summerlands,” Tom Allen’s fifth solo exhibition at Richard Telles, the bruised cherubs, lurid flowers and graveyards of his earlier paintings were supplanted by more subtle, but no less Romantic subjects: a gloomy landscape illuminated by candlelight, birds receding through stormy clouds, an ecstatically beautiful abalone shell against a red sky, and, in the title series, four small oils of isolated, gnarled trees that Allen brought to the exact brink of anthropomorphism, suggesting entrapped, petrified souls. Is anything less contemporary than the concept of souls? It’s hard to imagine an artist today referring to the old-fashioned soul without a thick gloss of irony. But Allen, on closer inspection, is not dealing in irony. His paintings are rendered with too much straightforward conviction and precision to be essentially ironic, and they project urgency—in part because the version of reality they reflect is pointed and intense. 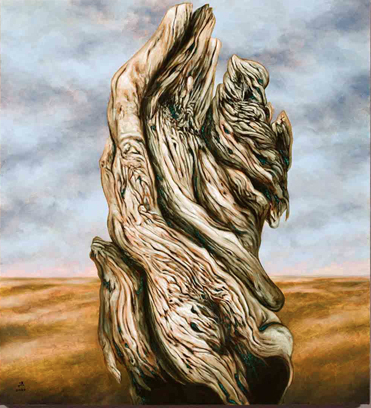 The tree roots in “Landscape with Two Candles” (2010), for example, are painted in such hyper-focused style that they resemble whips, in a painfully crisp image that recalls Rilke’s description, in The Notebooks of Malte Laurids Brigge, of his “Fear that a small woolen thread sticking out of the seam of my blanket may be hard–hard and sharp like a needle.” Also, as in “Polished Shell” (2009), Allen’s paintings sometimes lunge at beauty the way their Romantic predecessors would, with abandon. The painted candlelight in “Two Candles,” licks of bright orange striping the tree stumps, is another example of this—a visual high point of the exhibition, an unassuming, surprising flourish that helps this painting outshine the twisted-tree portraits, for all their technical ability. What makes Allen’s paintings peculiar, even while boundary-hopping and cross-referencing characterize a fair amount of today’s art, is that they don’t just appropriate Romantic imagery; they cloak themselves in that era’s attitude. The paintings’ relationship to this attitude is interesting. You can imagine various stances for a present-day artist to take toward the Romantic mindset, from critical to reverent, offhandedly curious to intensely academic, and, perhaps most likely of all, clinical—but Allen’s approach doesn’t fit any of these. It’s not that his adoption of the Romantic mood is unselfconscious, but the paintings, rather freshly, do without an overt meta-layer that rushes to account for their anachronistic subject matter. Their yearning for a time when art reached unabashedly for sublime experience is only half in quotation marks. In a way, they mourn a defunct way of seeing as someone would mourn (to use a Romantic term) a departed soul. It’s fitting that “Summerlands” takes its title from a largely forgotten theory—a concept of afterlife invented by a nineteenth-century spiritualist, Andrew Jackson Davis, who imagined souls of the dead absorbed into a celestial band of “solid, spiritualized matter.” In an artist’s statement, Allen points out that this idea seemed both to suit his portraits of formerly living trees and to describe the simultaneously material and ethereal space of painting–but it’s also a functioning metaphor for the afterlife that ideas can find in art. Inescapably, the word “Summerlands” also conjures Southern California (Allen lives here), itself a kind of utopian—or dystopian, take your pick—afterlife in the popular mind. But in the end, Allen’s paintings may engage L.A.—and even Romanticism, their apparent central subject—only incidentally. The nature of the conceptual overlays through which different people at different times view the world, and the prospect of examining, perhaps reanimating, these overlays through art, seems at the real core of his project. 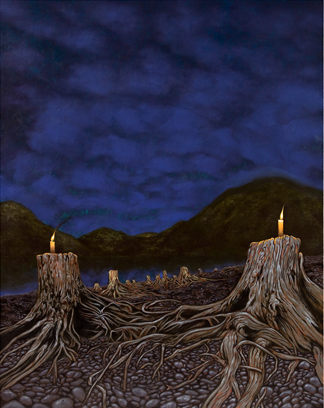 “Landscape with Two Candles” could be Allen’s metaphor for the past: felled but not totally dark, twining its undead roots into the present.